New York Fashion Week has taken center stage in recent years as a way to give fashion and luxury brands a chance to shine around hundreds of events throughout New York City in February. This year, Instagram was at the center of the runway with marketers giving their audiences exclusive access to your average Jane through photos and 15 second video clips. Social Curation and Analytics company Curalate used their technology to measure data from NYFW related hashtags on Twitter and Instagram and discovered that nearly 100,000 New York Fashion Week related photos were shared by more than 33,000 unique Instagram users. The top ten branded Instagram accounts surrounding #NYFW drove 2.5MM+ interactions on Instagram from February 6th – February 13th and averaged about 7 posts per day. In terms of popularity, Michael Kors was the overall brand winner of NYFW. On average, their NYFW photos generated 37,448 interactions (likes + comments) per photo, more than 2x than the runner up, Nasty Gal (14,273). The most liked photos were mainly product-driven, as seen in the photos by Michael Kors and Essie Polish below. 9/10 of the top photos were taken on site at NYFW. Perhaps more telling is the fact that there were so many other Instagram activations designed to bring the everyday photographer closer to this experience, not just about the best branded posts. 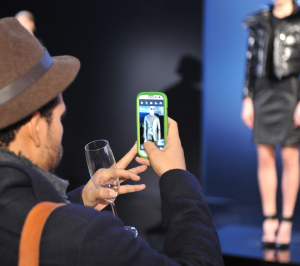 Kenneth Cole’s iPhone runway walk saw models coming out and taking photos of the audience while Marc Jacobs Tweet Shop allowed customers to “buy” products using Tweets, Instagrams, and Facebook posts as social currency. Brands are providing a healthy balance of high-quality editorial on their social channels, while also building community programs to amplify their message and actively engage their fans’ social circles.